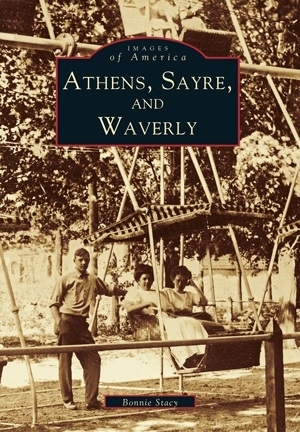 With Athens, Sayre, and Waverly, the first pictorial history of the valley, Bonnie Stacy has created a nostalgic look at the picturesque communities where the Susquehanna and the Chemung Rivers flow together. Over 200 rare images from the late 1770s to the present chronicle the proud lumber, canal, and railroad traditions that first drew residents to this bucolic area. From the unique house photographs taken by local photographer M. Louis Gore to the unusual archaeological and historic photographs from the collection of the Tioga Point Museum, these images bring the past to life. In Revolutionary times, Tioga Point was the location of Fort Sullivan. Later, the area was settled by lumbermen, canal workers, and railroaders. Included here are painted portraits of the well-known founders of the settlements in the area, as well as those of everyday people—millworkers, shopkeepers, and bridge builders—who made their marks here and enriched their communities. Price-$21.99 plus $1.32 tax-Total $23.31 plus $5.00 shipping and handling.